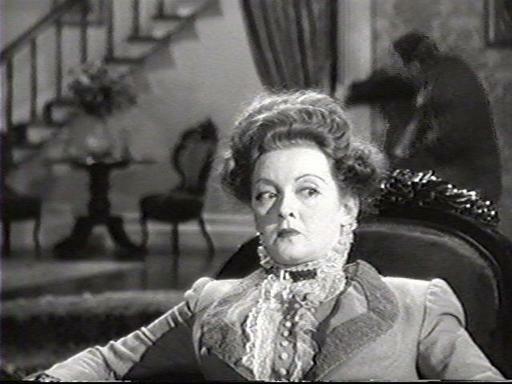 To say The Little Foxes is a triumph for Bette Davis is an understatement. The story of conniving southern siblings seeking to further their riches to the detriment of their workers and customers was seemingly designed for the evil qualities Davis brings to her role. Davis begins the picture looking absolutely stunning in very complimentary Orry-Kelly gowns and favorable makeup but somehow as the film progresses, what I first viewed as a gorgeous face turns into a horror-inducing facade. Late in the film she sits slouching in an armchair as her husband succumbs before her with an unmoving expression of surprise and evil that I might never shake. Regina sits as a statue as her husband stumbles to his death. The Little Foxes also marks the screen debut of Teresa Wright. The 22 year old had stage experience but really shows her talent by giving an Oscar-nominated performance as the sheltered daughter who becomes wise to her family’s infamy and develops a spine by film’s end. I have always found Wright to play consistently nice-girl roles, and this spot is no different, yet she really comes off as a master. The star also set a precedent by being nominated for an Oscar for her first three performances, winning one for her second, Mrs. Miniver. In total, The Little Foxes was nominated for nine Academy Awards but won none of them. Davis was given a Best Actress nod and another Supporting Actress nomination went to Patricia Collinge, who plays the air-headed sister-in-law to Davis’ Regina. Collinge is absolutely magnificent and at times reminded me of Katharine Hepburn‘s performance in Long Day’s Journey into Night. Given the overabundance of fine performances, The Little Foxes has a lasting impact on the viewer. What begins as a normal southern family tale slowly transforms into a grotesque story of greed and manipulation. It is certainly among Davis’ finest work and a must see for any film fan. The Little Foxes is set for 8:45 a.m. ET Feb. 2 on TCM.